Sometimes, the concept of the ads become very popular. For example, Hutch ad with the dog, Washing Powder Nirma ad etc are very popular. 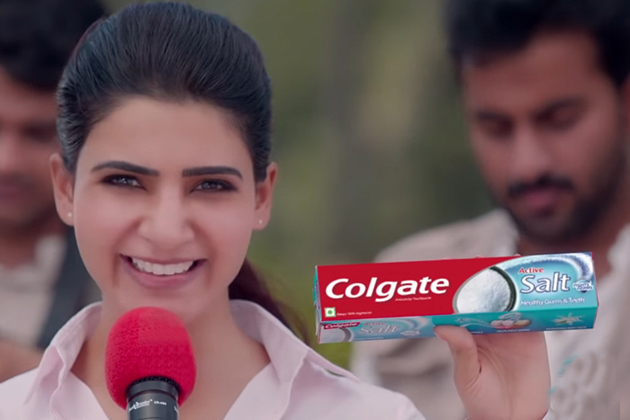 The recent ad which is also gaining popularity is Colgate active salt ad. The line 'Me Toothpaste lo Uppu vunda' (Is there salt in your toothpaste) became so famous. Where ever we see on social media, there will be hundreds of jokes, memes based on it. Until recently, Kajal Agarwal used to become a journalist who asks this question. In Bollywood, we have seen Kareena Kapoor, Priyanka Chopra sizzling in that ad. Even Trisha also appeared for some time. Now, the same ad is coming with two new popular faces. Anushka Sharma is asking the same question to North Indian audiences whereas Samantha is shooting that question on south audiences. However, the dubbing for Samantha in this ad was given by someone else but not Chinmayi who gives her voice for Sam's voice. The fans are wondering how would it be if Chinmayi says that dialogue in Jessie (Ye Maaya Chesave) style.